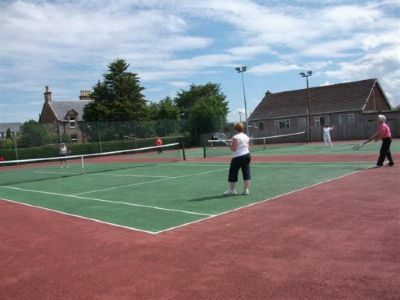 Welcome to the Fortrose and Rosemarkie Tennis Club website! The Tennis Club has two all-weather courts and over 100 members of varying ages. It's been in the same sunny, sheltered location since the middle of last century. You can get to the Club by turning right into Castle Street in Fortrose, just before the Co-op. The courts are around 200 metres further on the right hand side. If you would like to join the Club please see our Members section. If you already have a form send it in to Maggie MacDonald, The Old Bakery, Long Road, Avoch IV9 8QR. For the occasional casual game of Tennis the cost to visitors is £10 per court per 1hr, to be put in the box at the club house beside the courts. During the summer months the courts are generally open from early morning to late evening.